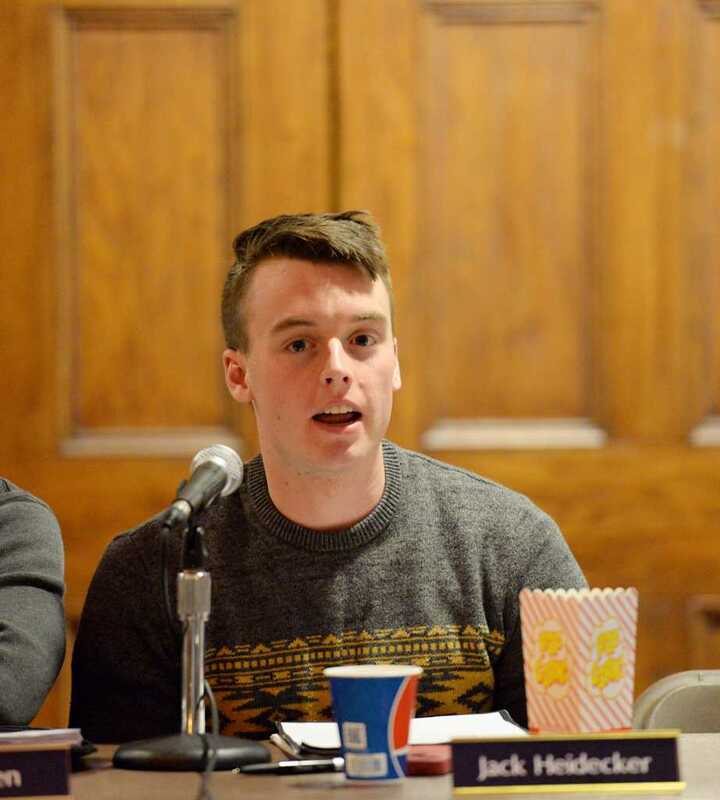 Pitt Student Government Board member Jack Heidecker wants Pitt’s campus to breathe easy. At SGB’s weekly public meeting Tuesday, Heidecker introduced a resolution supporting the ban of tobacco use on Pitt’s campus. If the board passes the resolution next week, SGB will formally support any future Pitt policies for a tobacco-free campus. Heidecker included all tobacco products in the resolution, including chewing tobacco, cigarettes, cigarillos, hookah products and electronic cigarettes. While the resolution supports the ban on the use of cigarettes, Heidecker said it does not advocate prohibiting the possession of tobacco. Heidecker said he is in the process of taking feedback from students on the resolution through SGB’s Facebook page before the resolution comes up for a vote. In the fall, the Student Health Advisory Board launched the Breathe Easy, Pitt campaign in support of banning tobacco products on campus. SHAB has been working with SGB to get student support while it writes a tobacco-free policy for the University. The University Senate Council would have to approve the proposal before it becomes campus policy. Ethan Baker, president of SHAB, said the Breathe Easy, Pitt campaign has collected 800 signatures on its online petition from students, staff and faculty since last fall. “We believe that this will improve the campus environment in numerous ways, ranging from reducing secondhand smoke exposure, a known carcinogen, to reducing fire risks, to helping to build a more sustainable Pitt,” Baker said in an email. Baker said the policy SHAB is currently drafting is meant to encourage smokers to change their habits, not punish them. “It’ll be the same Pitt, but you won’t have to navigate through clouds of smoke and mounds of cigarette butts just to get inside Hillman or the Cathedral,” Baker said. Heidecker said nobody has approached him with negative feedback since he joined the Tobacco-Free Task Force, a coalition of administration and faculty belonging to the University Senate Council, the Graduate School of Public Health and the Staff Association Council, in November. If the board passes the resolution in coming meetings, Heidecker said SGB plans to take the resolution to Chancellor Patrick Gallagher in hopes he will support policies against tobacco use. In other action, SGB will vote to approve 10 students at the new Allocations Committee at next week’s meeting on Tuesday. If they are voted in as committee members, Stephen Berry, Gianna Callisto, Marcus Robinson, Brian Crowley, Naran Babha, Zachary Ward, Jonathan Brennan, John Leskovich, Gabby Galterio and Erin McMahon will start their terms on April 22. Two spots remain open for incoming first-year students next fall. A committee consisting of Allocations Chair Nick Reslink, Board President Nasreen Harun, Allocations Vice Chair Max Kneis and newly appointed Allocations Chair Madeline Guido selected the candidates last Saturday. According to Reslink, 67 students applied for the positions and the committee interviewed 30 applicants. Reslink said he was impressed with the competitive application pool. Model UN requested $2,408.84 for a conference at the College of William and Mary. The Board approved $2,268.84 and denied $140. Panther Hurling Club requested $4,490 for a national tournament in Boulder, Colorado. The Board approved $4,220 and denied $270. Club Football requested $3,000 for helmets and shoulder pads. The Board approved the request in full. Pitt Jazz Ensemble requested $1,414. The Board denied the request in full. The Interfraternity Council requested $5,000. The Board approved the request in full. Greek Week requested $30,299.58. The Board approved the request in full. Pitt Rugby Football Club requested $5,514.663. The Board approved $1,540, denied $81 and deferred $3,893.63. The Asian Students Alliance requested $12,626.47. The Board approved the request in full. The Nursing Student Association requested $4,914.15. The Board approved the request in full. Resident Student Association requested $29,139.36. The Board approved $23,409.41 and denied $5,729.95. Engineering Student Council requested $24,763.61. The Board approved $15,210.93 and denied $9,552.68.